One of the best ways to relax is getting a massage. A massage is a nice treat after a long week or a hard workout. However, as they are mostly used for relaxation or leisure, people often forget that massages are administered for health reasons as well. 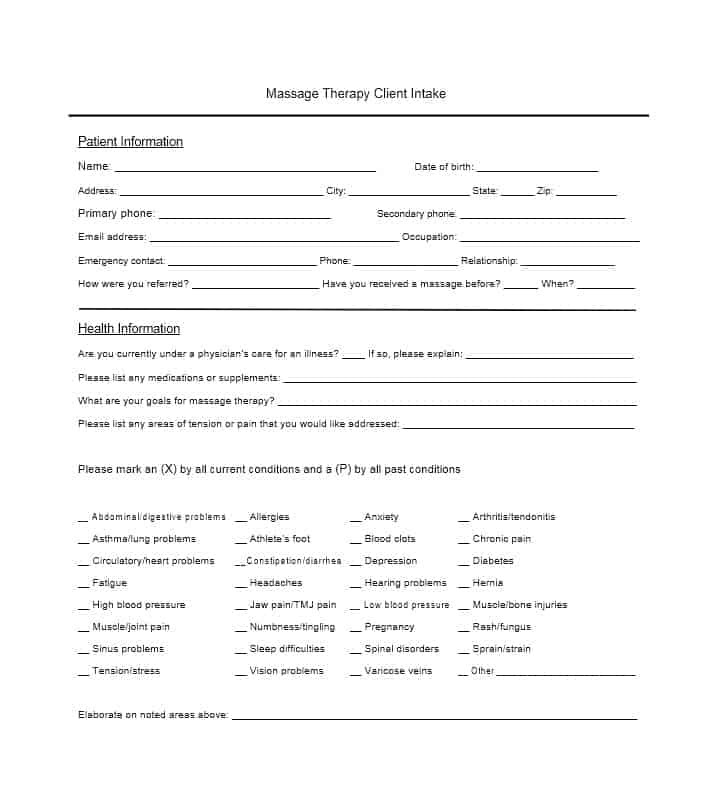 As massage is a therapy, the therapist providing the massage requires clients to complete a massage intake form. This allows the therapist to provide the best possible service. 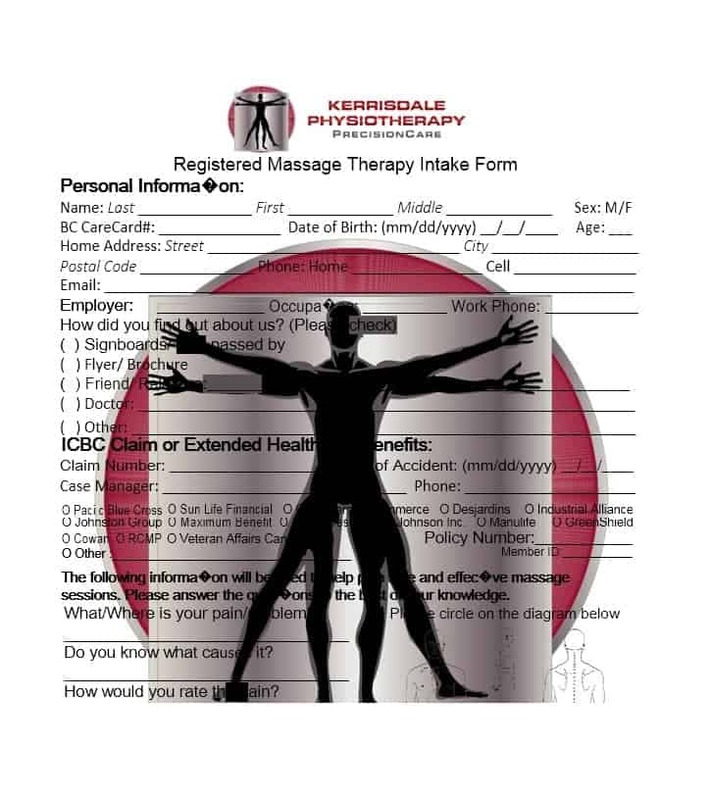 So, what is a massage intake form and what does it include? Let’s find out. What is a massage intake form? 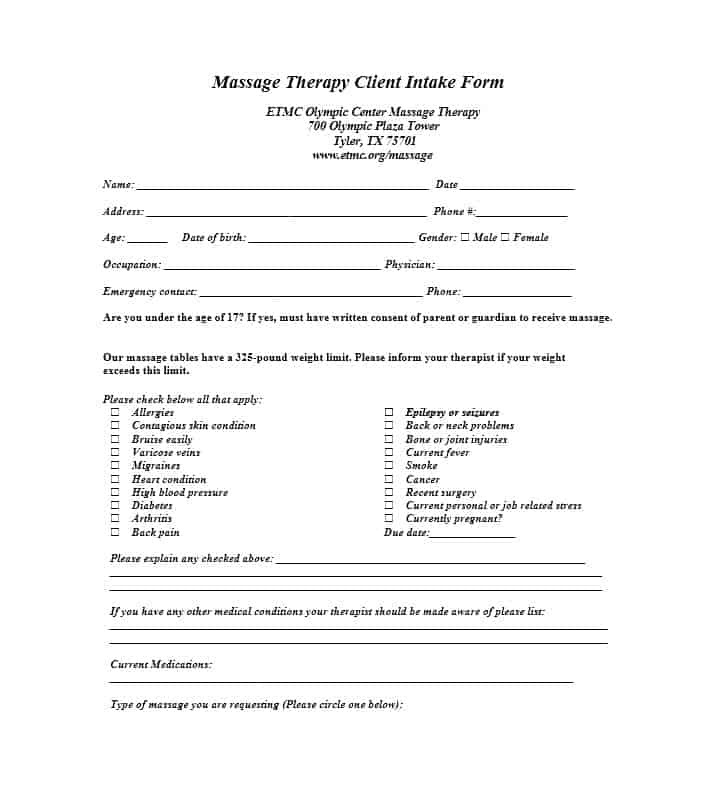 Also known as client intake form, a massage intake form is a way by which therapists record patient contact information, specify policies, and get an idea of the patient’s issues, medications, and contraindications. 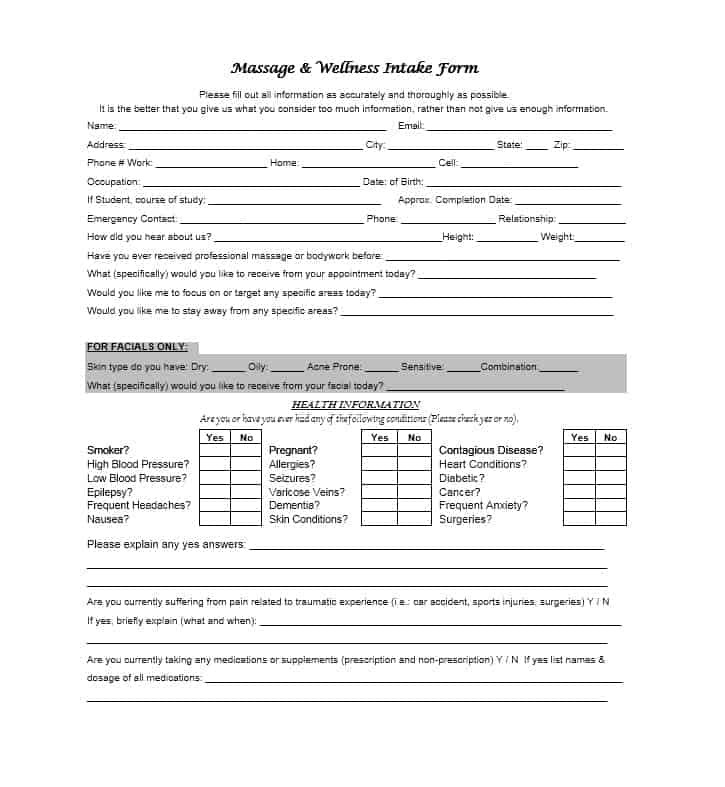 Generally, therapists require patients to fill out the massage intake form before their appointment. 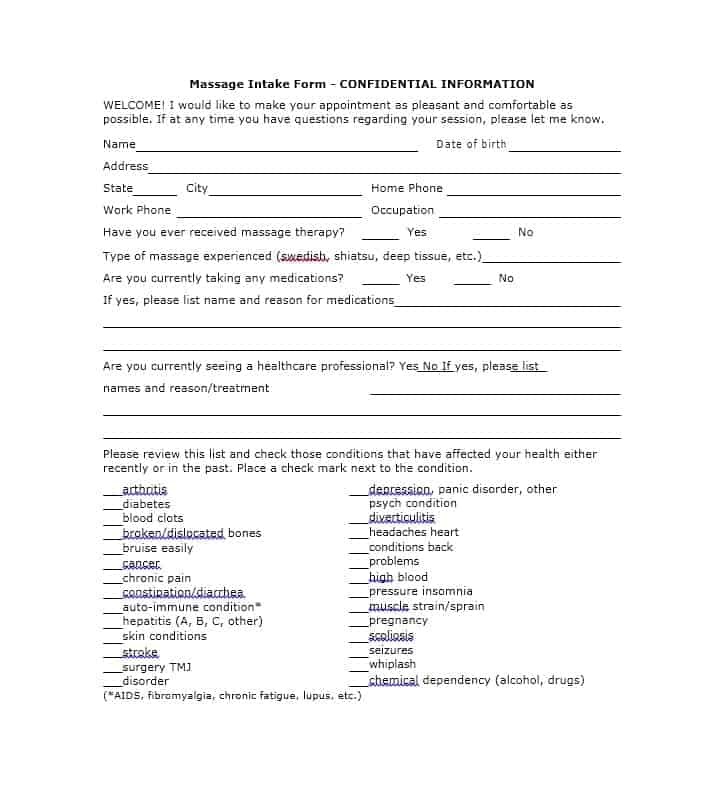 To ensure the form is completed before the appointment, the therapists send an online version of the form to the patients via mail. 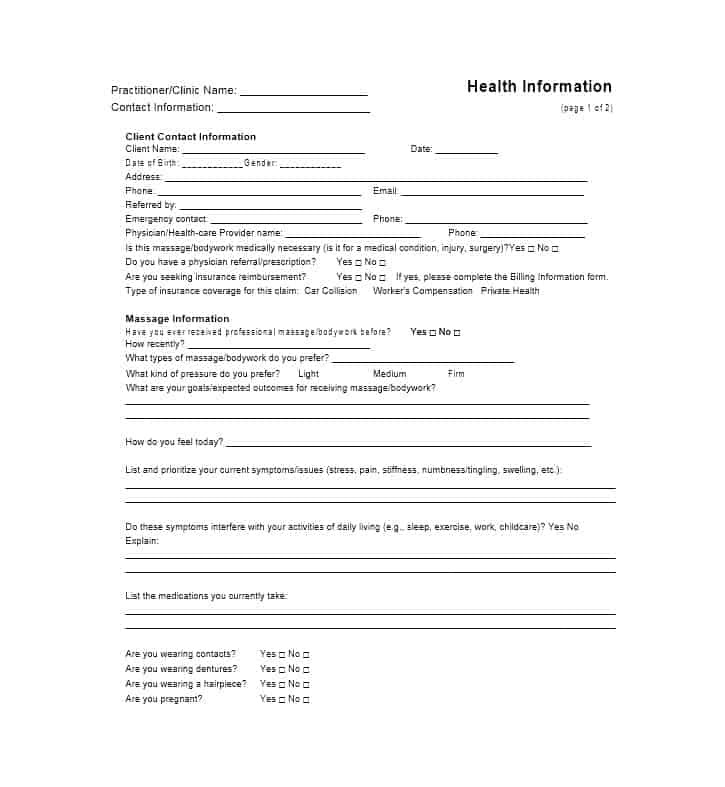 The aforementioned form requires the patient to provide personal information such as his /her name, address, DOB, city, phone number, email address, occupation, employer name, employer address, marital status, and emergency contact name and number. Additionally, the form asks the patient a series of questions. The purpose of these questions is determining the most suitable treatment/therapy for the patient. In addition to the above, the form seeks basic information related to the healthy history of the patient including skin, digestive, psychological, reproductive, nervous system, respiratory, circulatory, and musculoskeletal health problems. The final part of the form includes the consent of the patient. 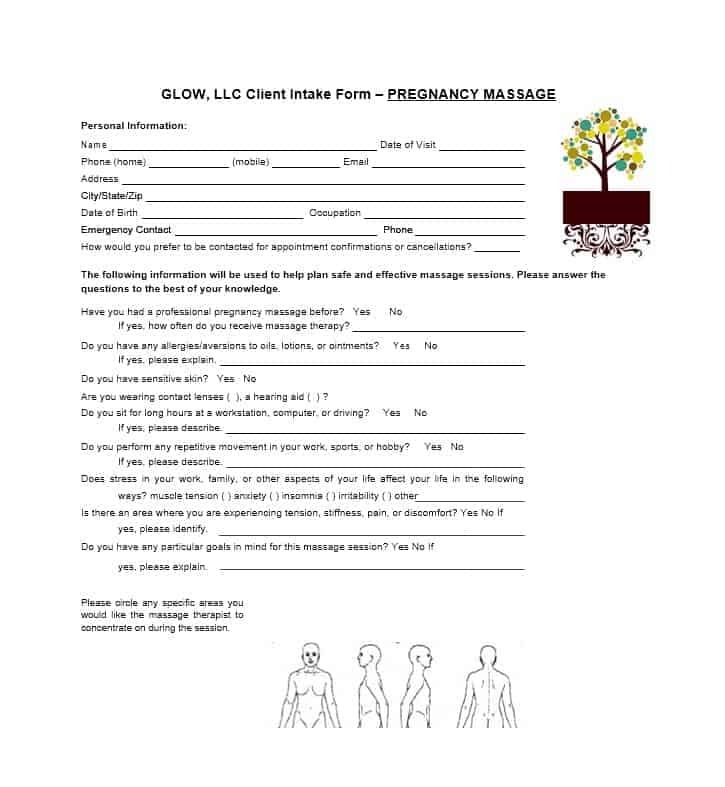 To find out what’s included in the consent, take a look at a massage intake form template. 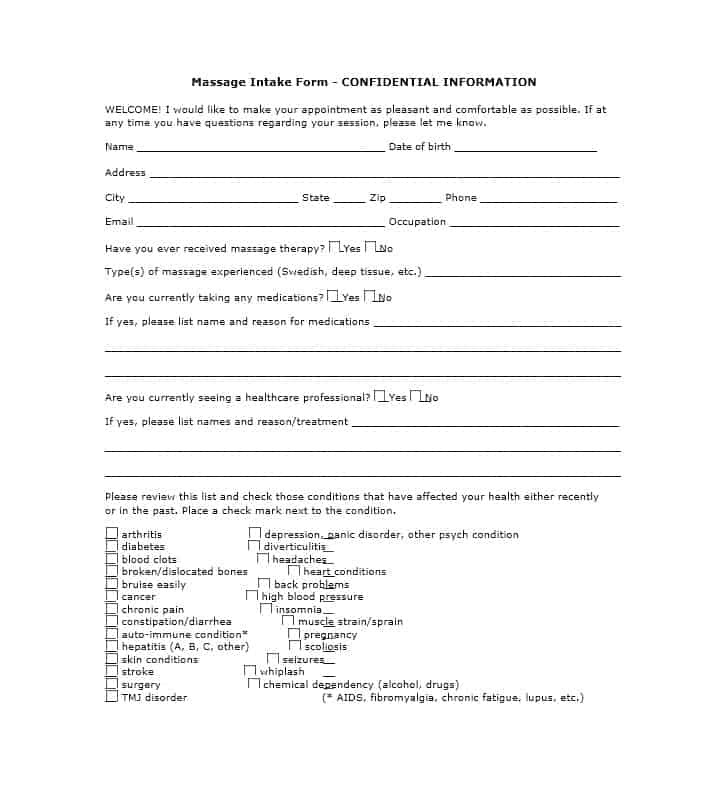 Today, many blank massage intake forms are available online. 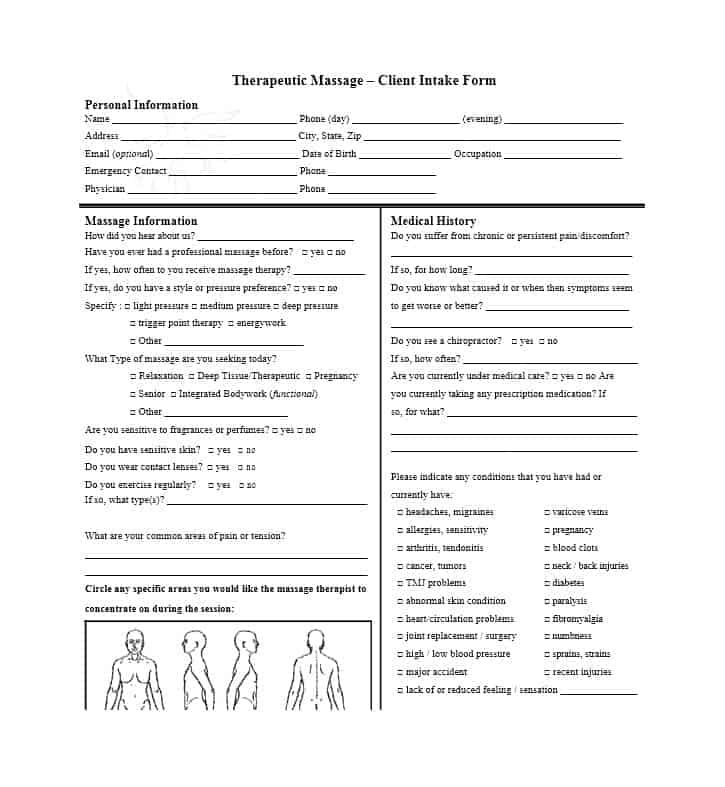 Therapists can download the printable massage intake form and use it to get the required information from clients. 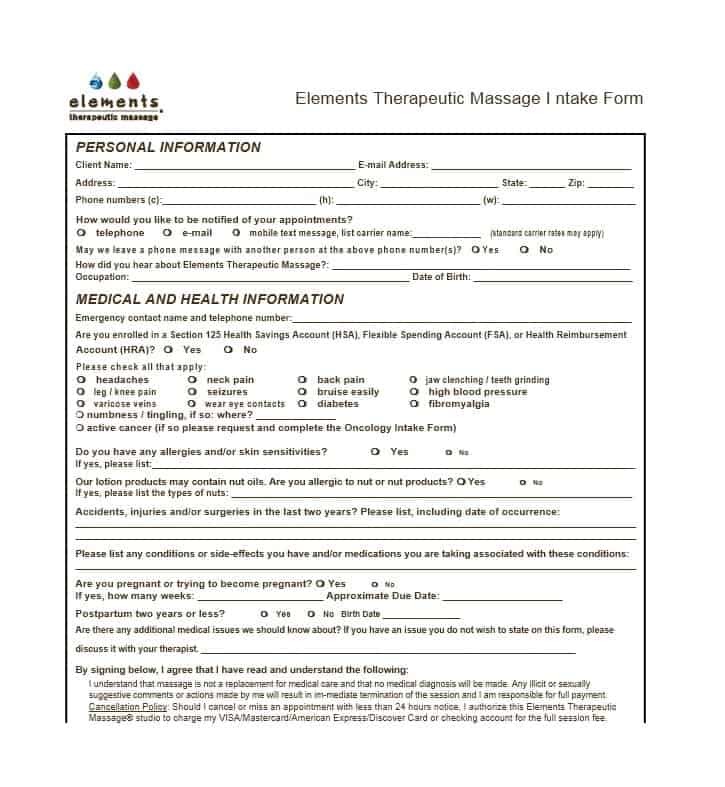 It is important that massage therapists complete a client intake form for each and every patient. 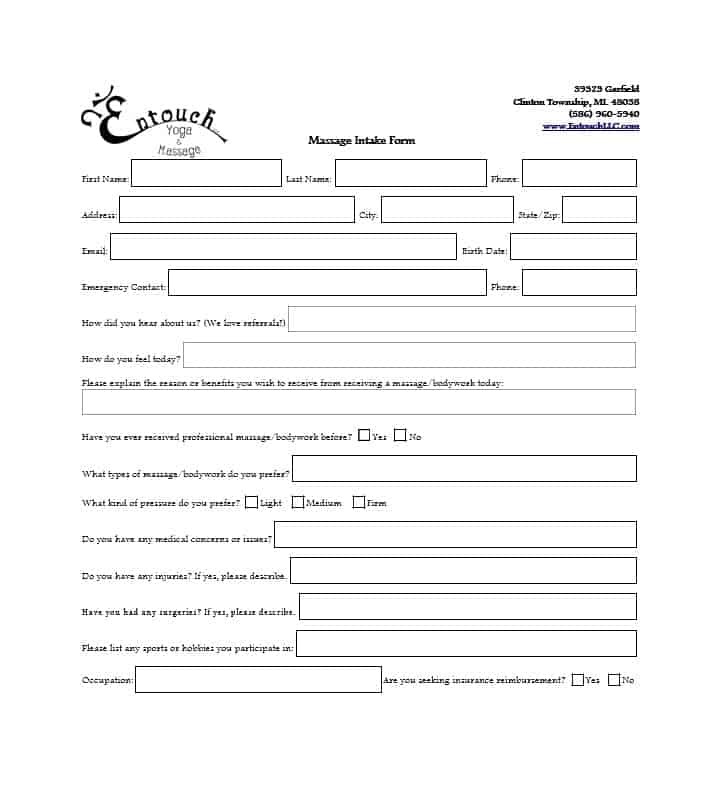 For therapists who are just starting out, a massage intake form template is a great resource. 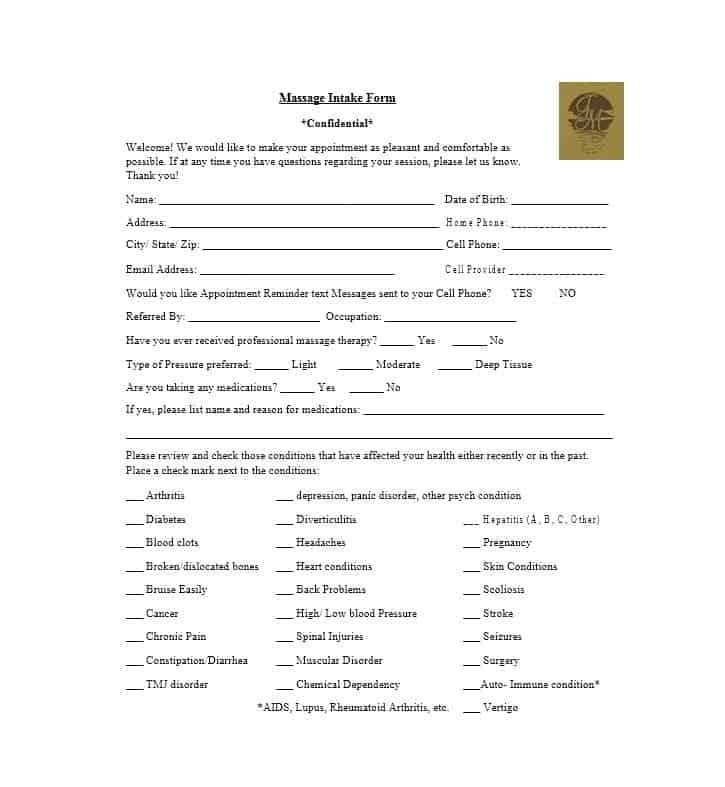 However, as a massage therapist, you must try to draft intake forms that are specific to your service. 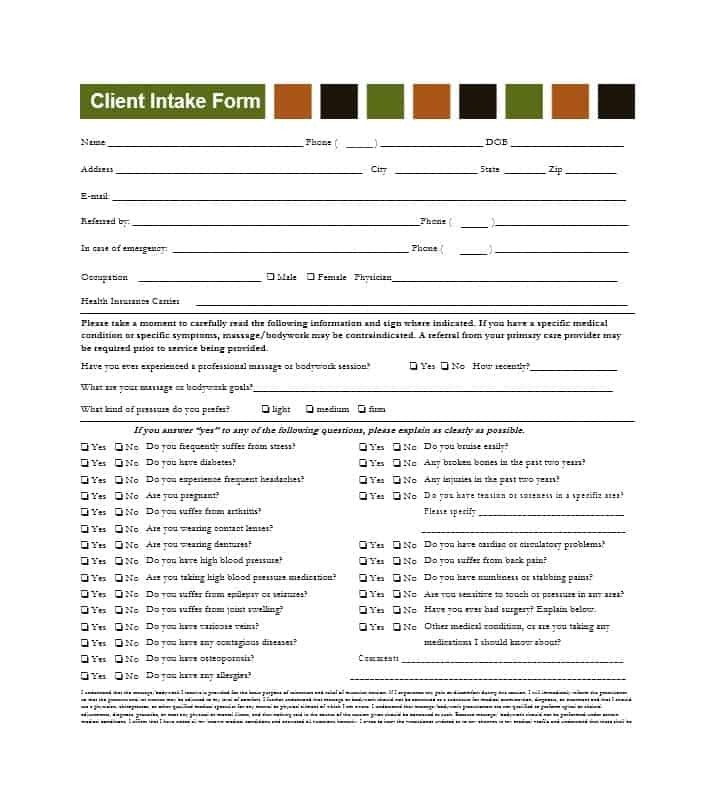 Regardless of who created them, all client intake forms should have the same basic questions. 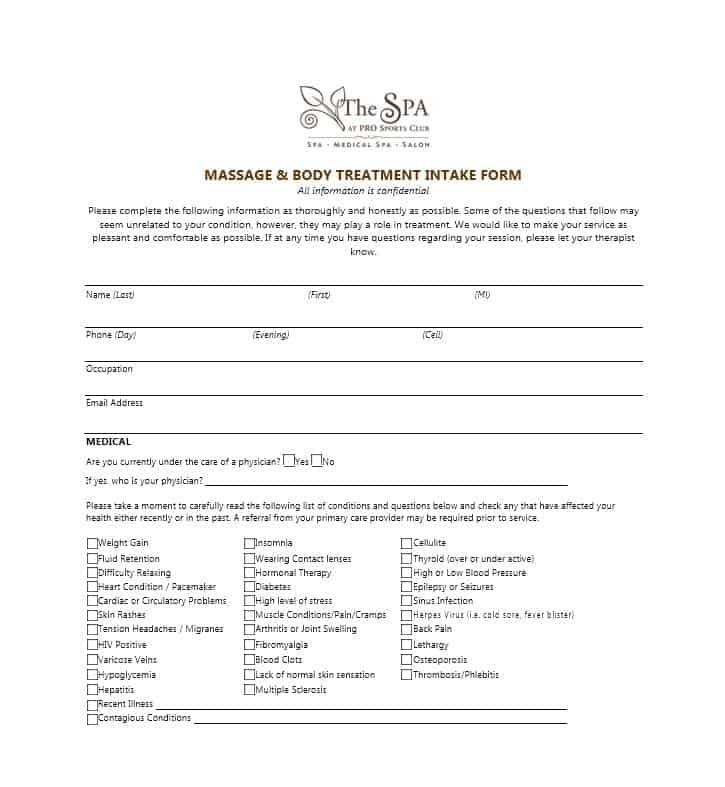 One of the most important things that a client intake form needs to have is a question that asks the client why he/she wants to get a massage. It is important to remember that not everyone gets a massage for relaxation or leisure. Some people visit a massage therapist only because they want to relieve themselves of pain. For example, many people visit massage therapists reluctantly after they have tried almost everything to alleviate their neck stiffness. Also, some people visit a massage therapist only because their physical trainer or doctor has asked them to do so. 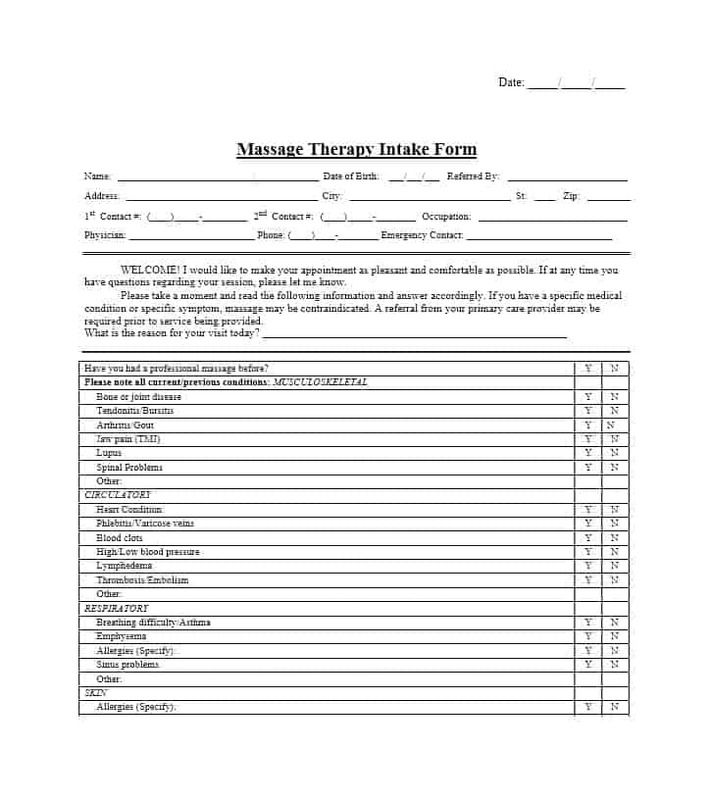 For the aforementioned reasons and more, it is important that massage therapists carefully note down in the intake form why the client wants to get a massage. Provided the procedure is performed appropriately, client or massage intake can help clients in a number of ways. By establishing clear boundaries, a client intake form protects massage therapists from potential unethical clients. Moreover, the form helps the therapist to protect his/her reputation. Client intake forms treat all clients the same way and ask them the same questions. 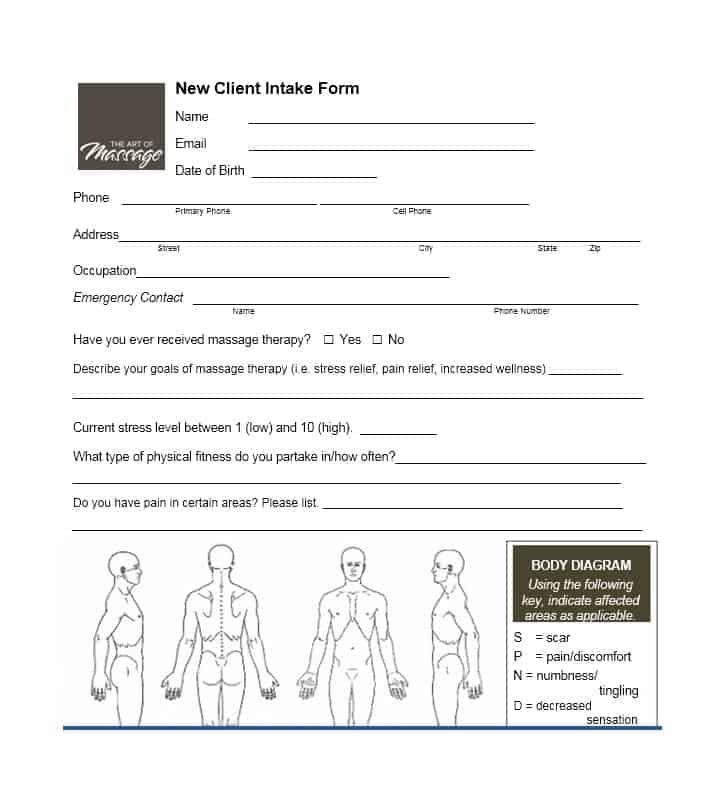 By putting nervous clients at ease, a well-drafted and properly worded massage intake form helps therapists to build a professional rapport with them right away. 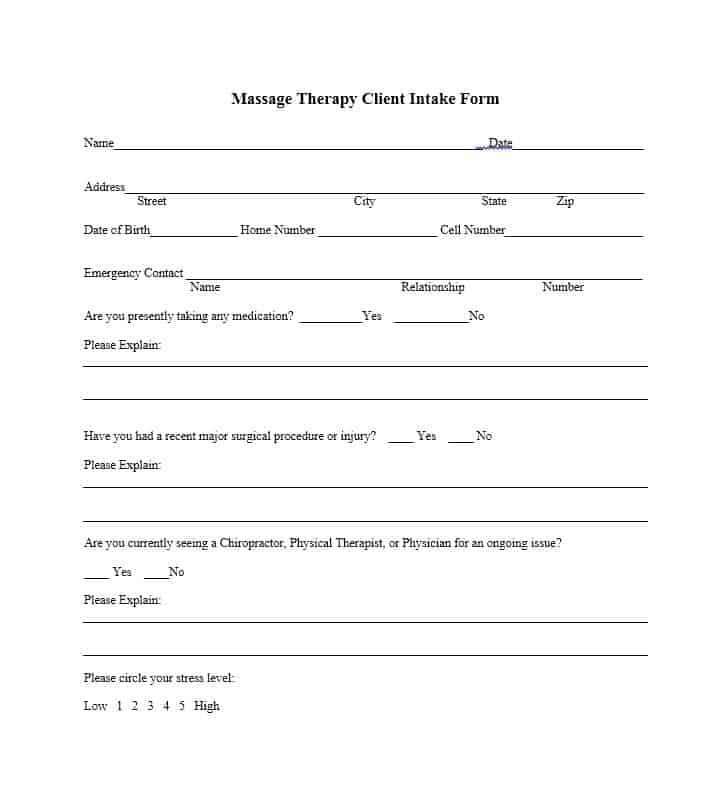 In addition to the above, an intake form allows the therapist to know how his/her client wants to proceed with the upcoming massage therapy session. However, it is important that massage therapists revisit the intake procedures with continuing clients. 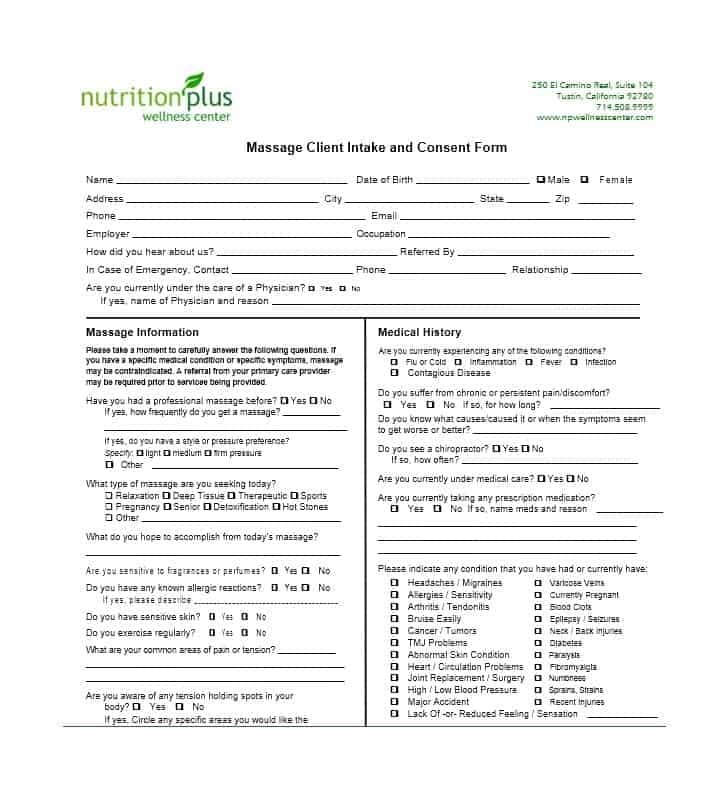 By updating the details in the massage intake form, therapists will keep themselves aware of the client’s ever changing health. This, in turn, will allow them to take care of the client appropriately. Following are some of the reasons a massage intake form is important. 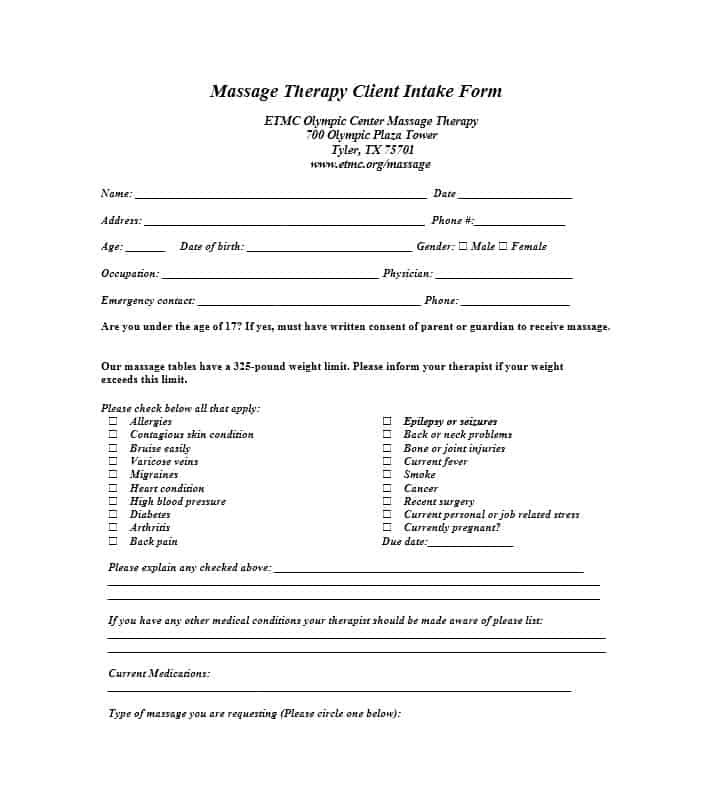 The first and foremost reason to use a client intake form is providing the massage therapist the information he/she requires to perform the therapy appropriately. Once the therapist is aware of all of the client’s health concerns, he/she will able to develop a personalized treatment plan for the client. This is related to the aforementioned reason. Ailments and health issues vary from person to person so the treatments the different clients get will vary as well. A treatment plan that the therapist uses successfully for one client may not work for another. 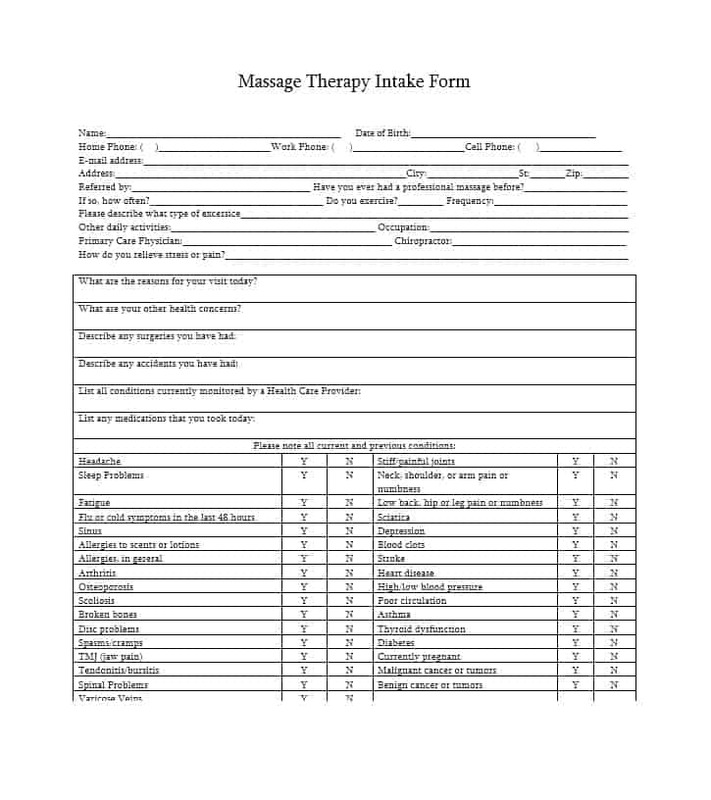 By revealing the issues faced by the client as well as what he/she wants to get from the therapy, the massage intake form allows therapists to develop individualized treatment plans. 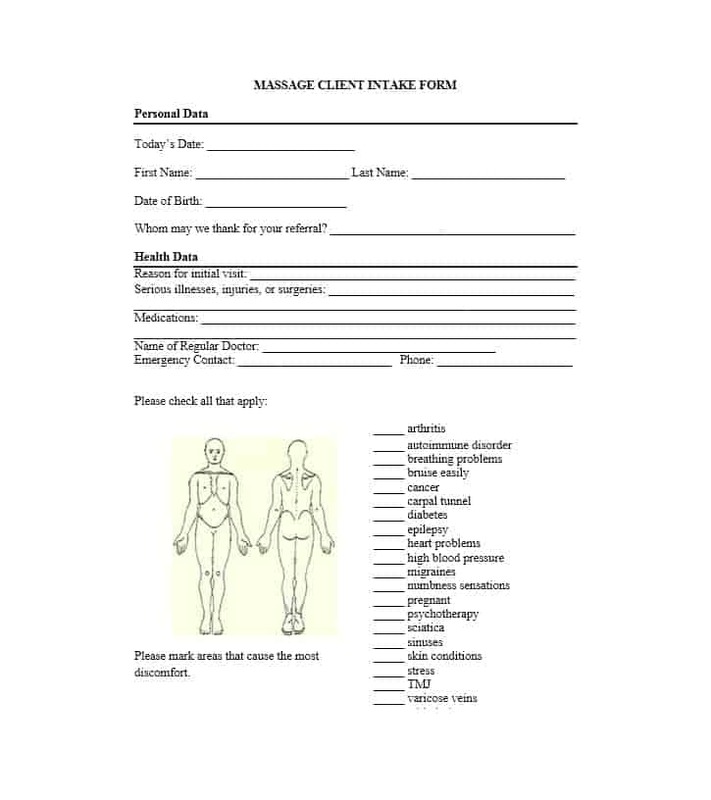 By informing massage therapists what areas they need to focus on, client intake forms make everything clear to them. Additionally, the form allows clients to play an active role in the development of their treatment plan and inform the client what needs to be prioritized. 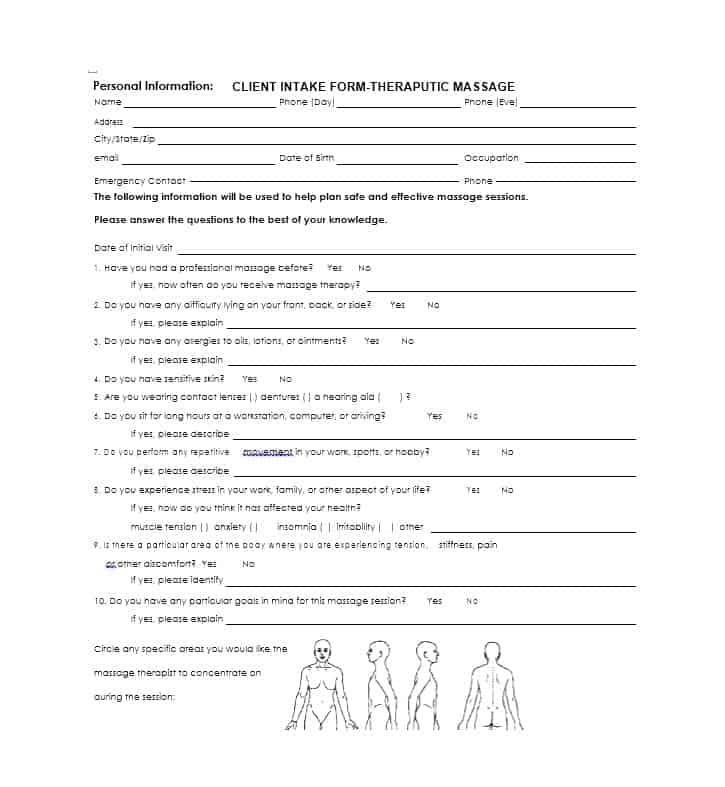 The client intake form is a great way for clients to inform therapists what they should avoid during the treatment. 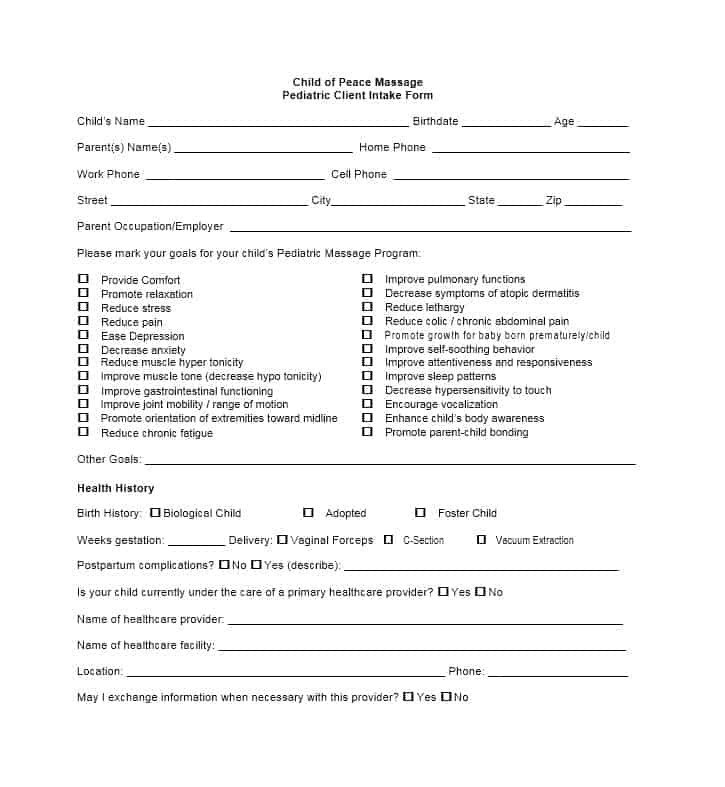 For instance, by informing the therapist about any allergies, injuries or accidents the client may have suffered, the intake form ensures that the therapist is extra careful when treating a client who has suffered an allergy, injury, or accident. As seen above, there are many benefits of using a client intake form. 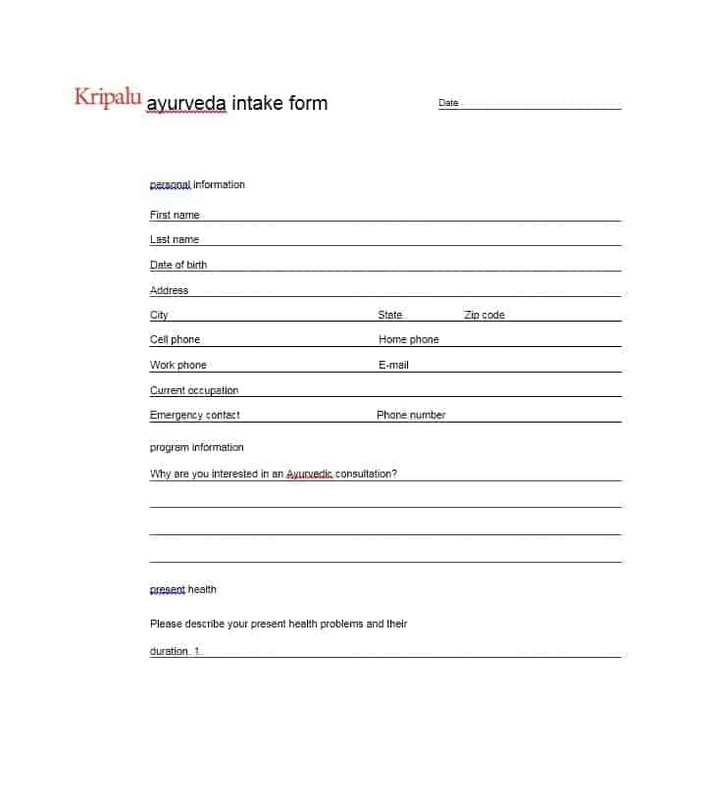 If you’re not sure about what to include in the intake form, you can take a look at a massage intake form template. 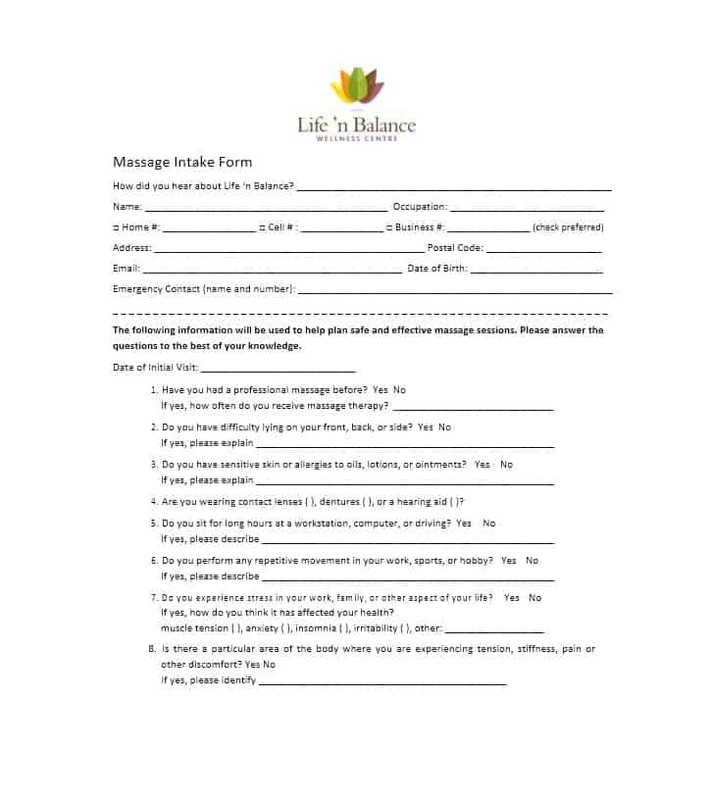 Talking about templates, you’ll find templates of many medical forms other than the massage intake form online. 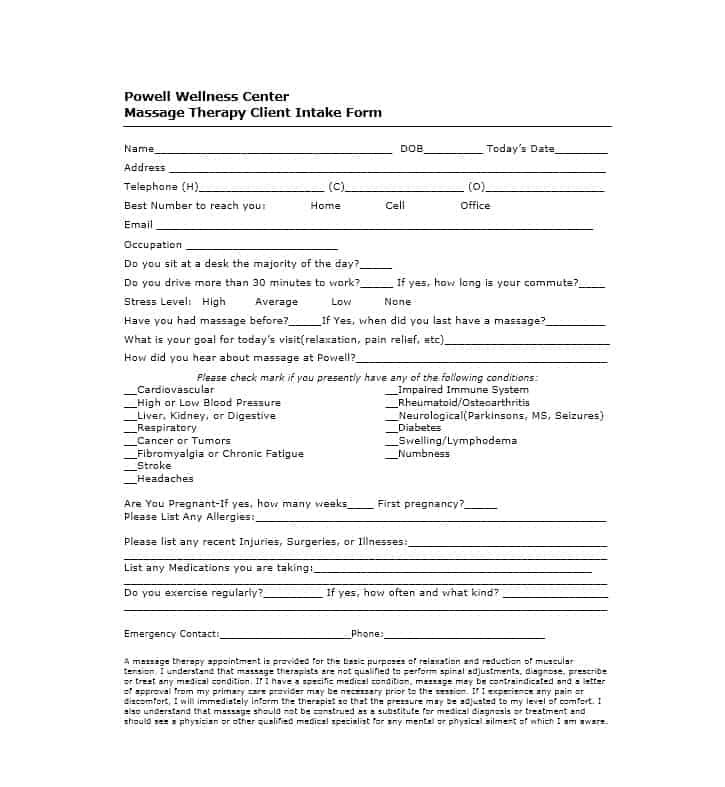 Some of the medical form templates that you’ll find online include the medical release form template, and the emergency contact form template. 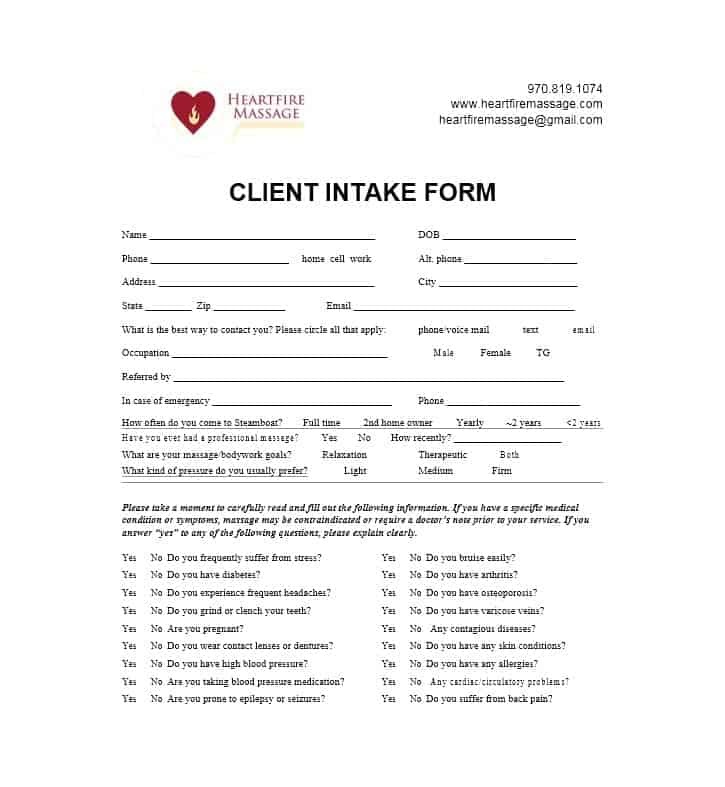 Now that we’ve discussed the importance of a client intake form, it’s time to look at what a printable massage intake form should contain. 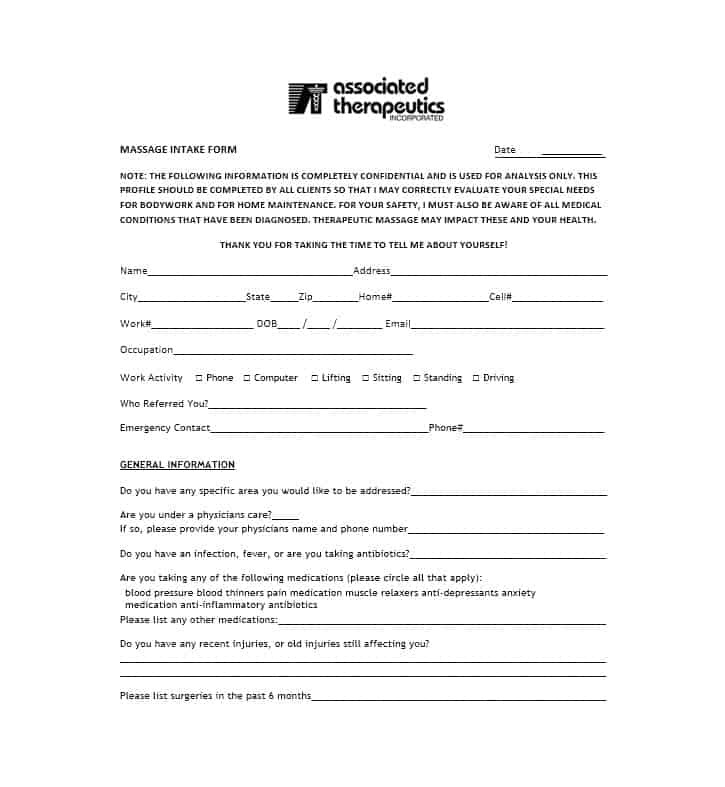 Creating a massage intake form is easy. 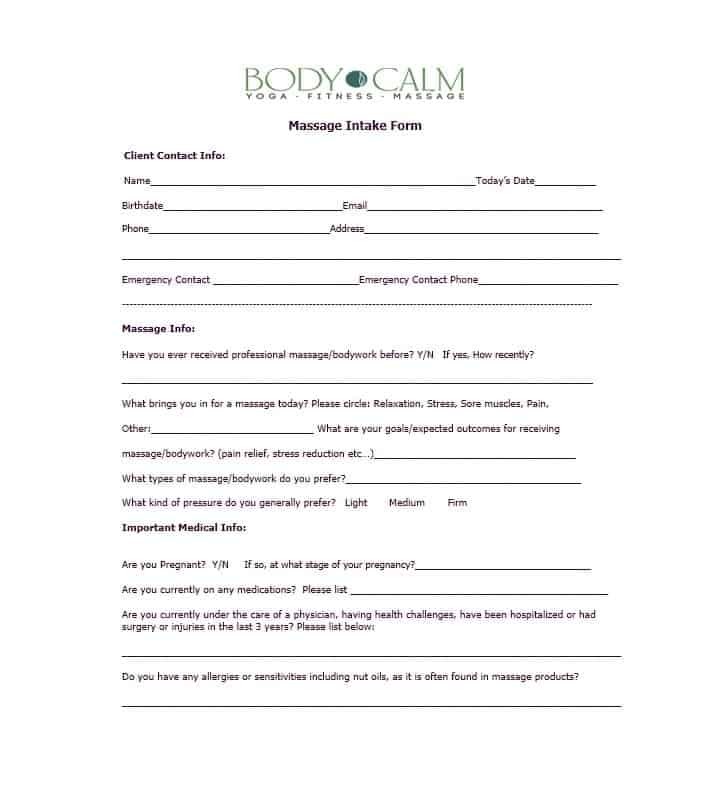 Simply download a printable massage intake form and modify it according to your needs and practice. 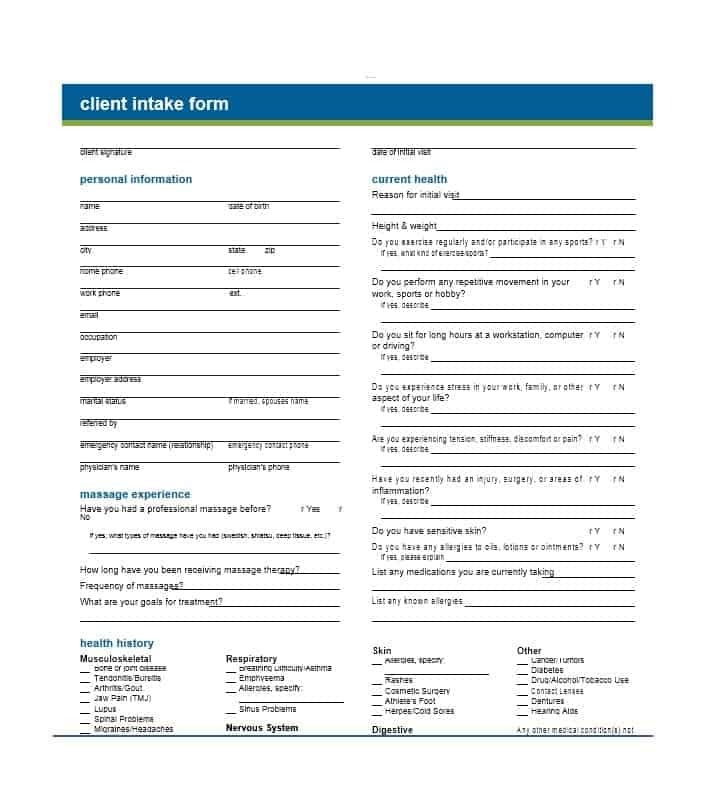 Nonetheless, it’s important for you to know what a client intake form contains. 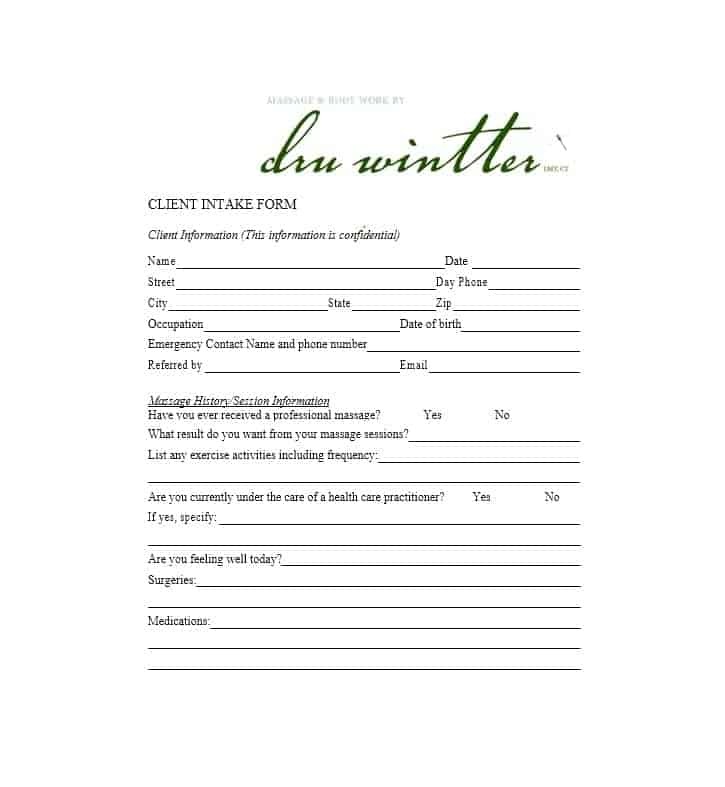 Following are things that a client intake form should contain at the very minimum. 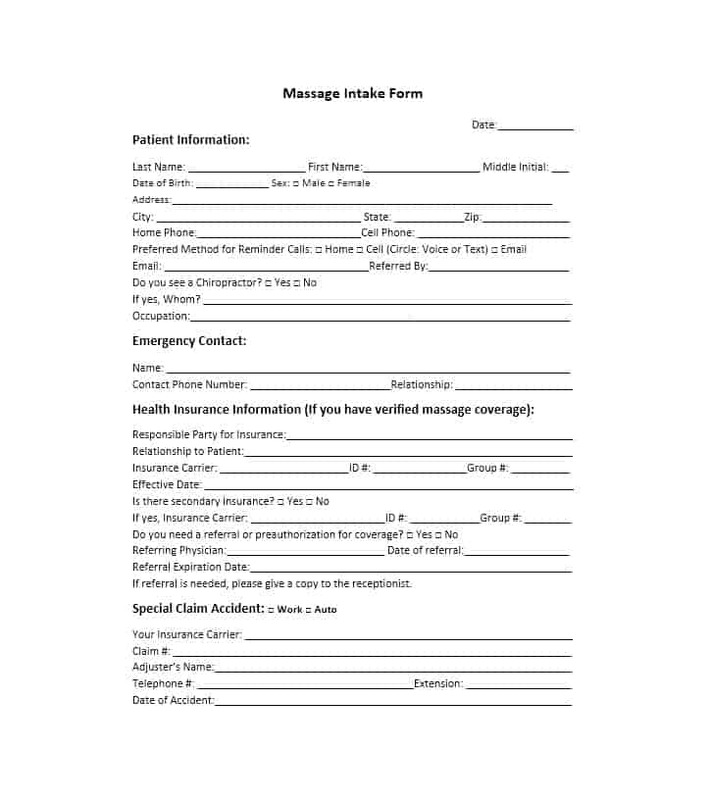 Just like any other medical form, a massage intake form needs to have the client’s personal information. This includes the client’s name, phone number, DOB, home address and email address. By providing the aforementioned information, clients will ensure that therapists are able to contact them after the conclusion of therapy session. 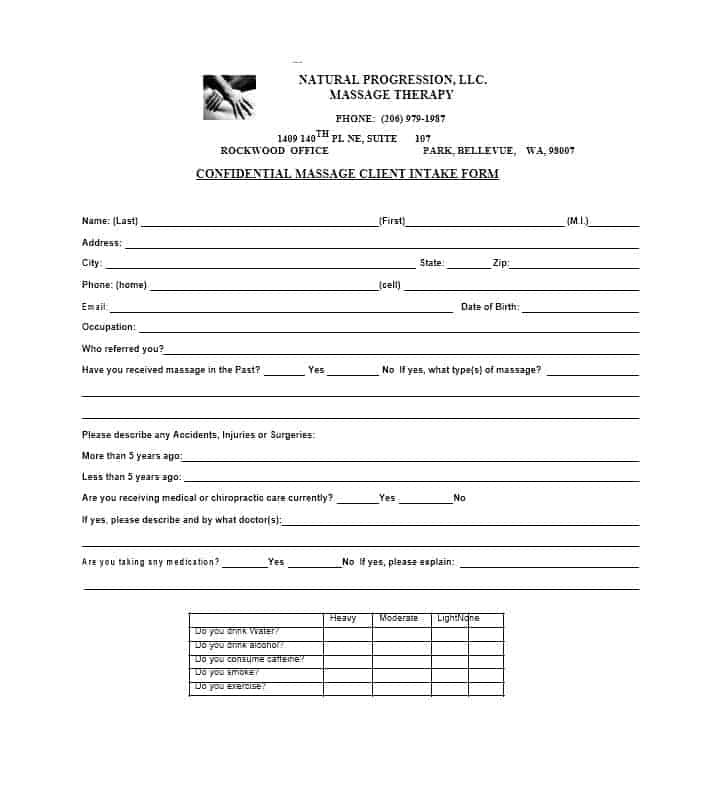 Though the client’s date of birth is required to bill insurance, the therapist can use this information to send a personal note or coupon to the client. The medical history of the client/patient is something that you’ll find in the majority of the medical forms. 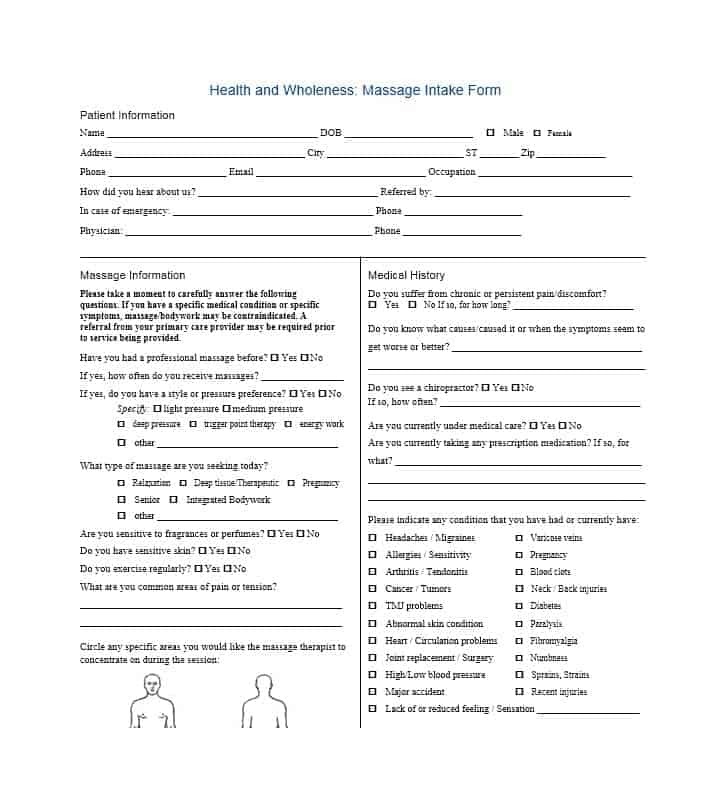 The massage intake form is one of them. 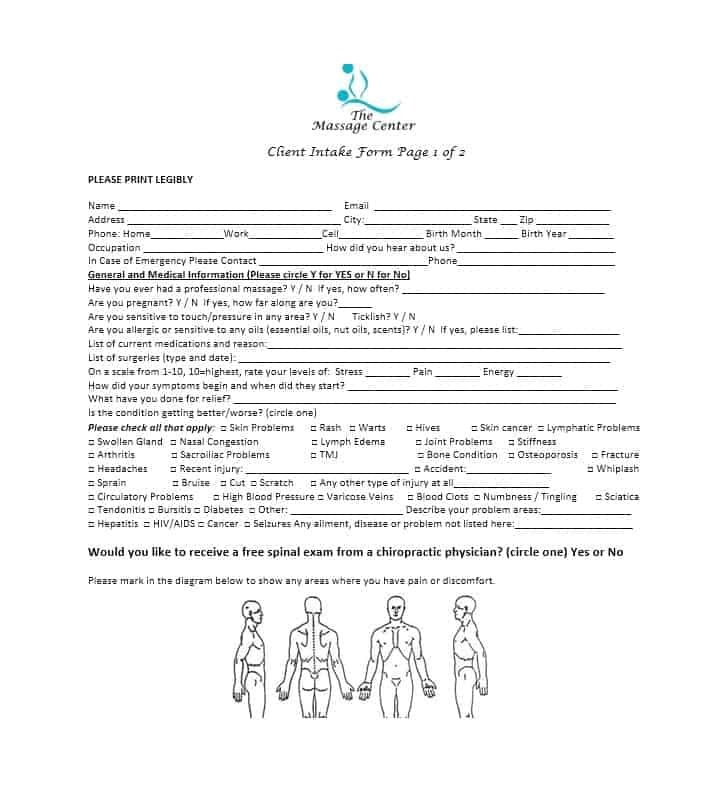 The medical history in the client intake form should show any recent injuries and surgeries, medical conditions, allergies, medications, infectious diseases, contraindications, blood-clotting issues, and other areas of concern. We discussed this earlier. 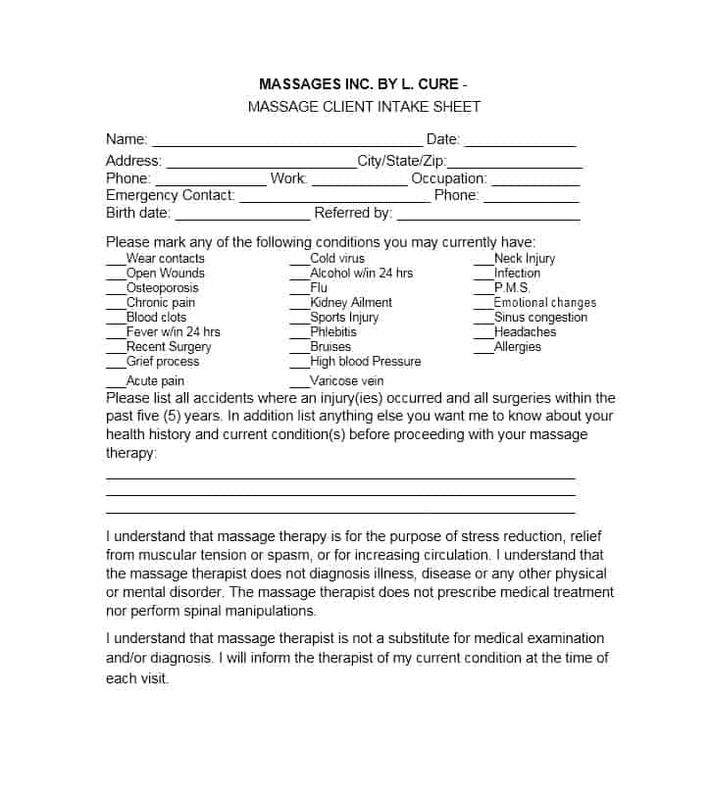 It is extremely important for a massage intake form to show why the client wants to get a massage. 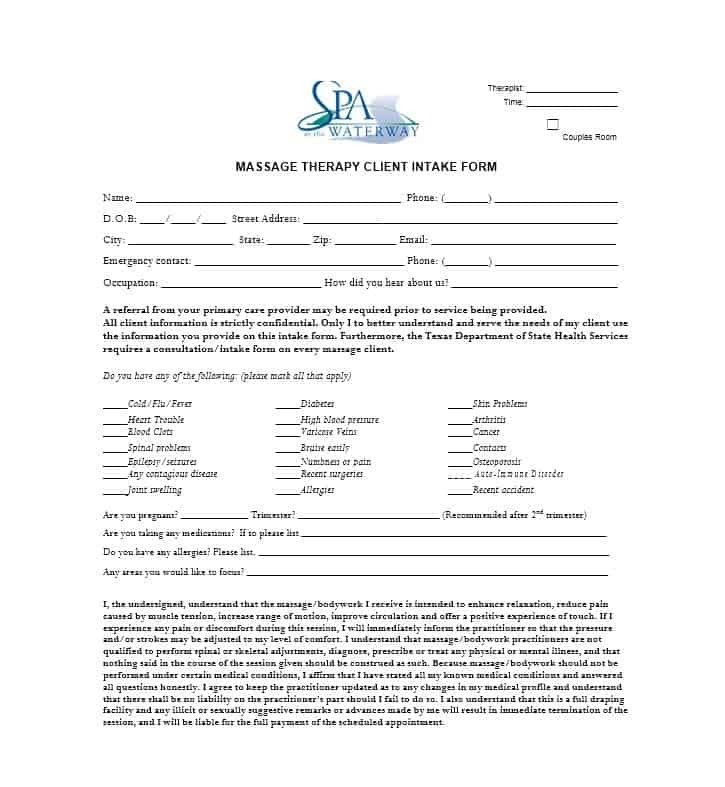 By jotting down in the form why he/she wants to get the massage, the client will allow the therapist to develop a treatment plan that is targeted towards his/her desires. Moreover, this will allow the client to inform the therapist what areas of the body he/she needs to focus on more. Also, when clients feel that they have control over their massage therapy session, they are less likely to feel nervous or concerned. This part of the form is for the therapist. Generally, the disclaimer is at the bottom of the client intake form. As it serves to protect the therapist from legal action, the disclaimer should include a few important things. This includes the policies of the massage therapist. It is important that the disclaimer clearly states that the therapist isn’t a doctor and won’t prescribe medicine or diagnose illness. Also, the disclaimer is a good way to inform the client about ethical norms and cancellation policies. The aforementioned things are some of the basic things included in a massage intake form. 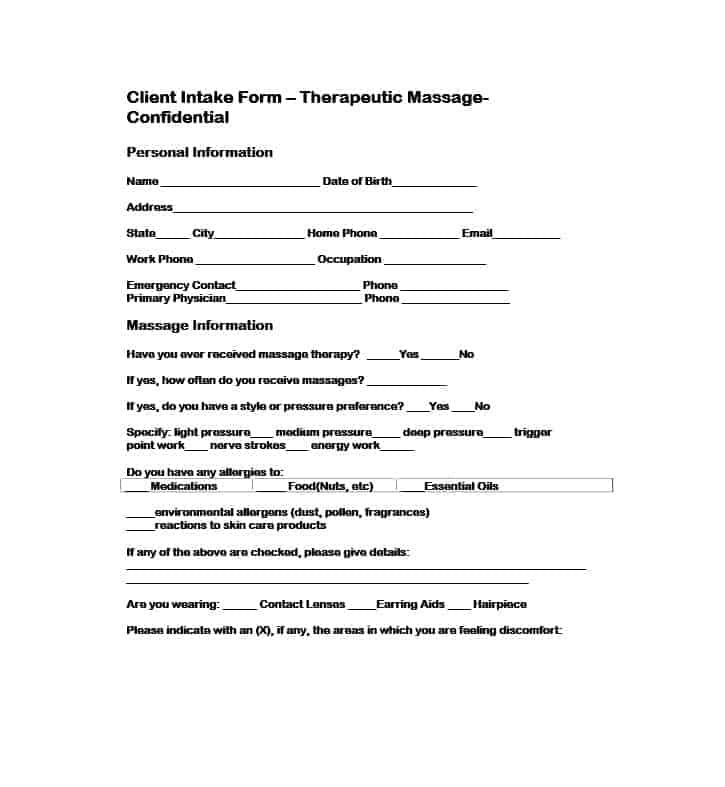 If you want to know what else is included in an intake form, take a look at a massage intake form template. 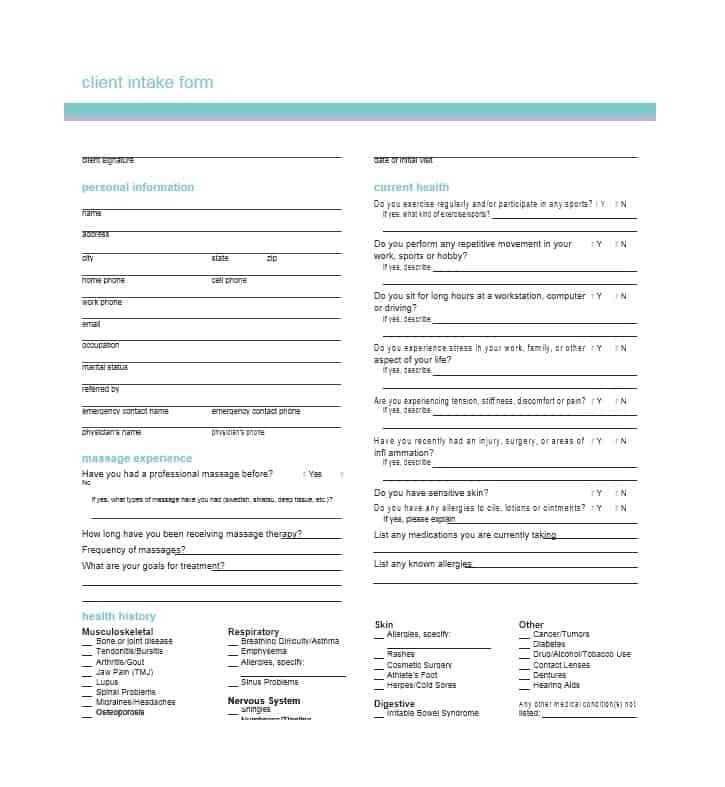 The template will reveal everything that you’d want to know about the intake form. 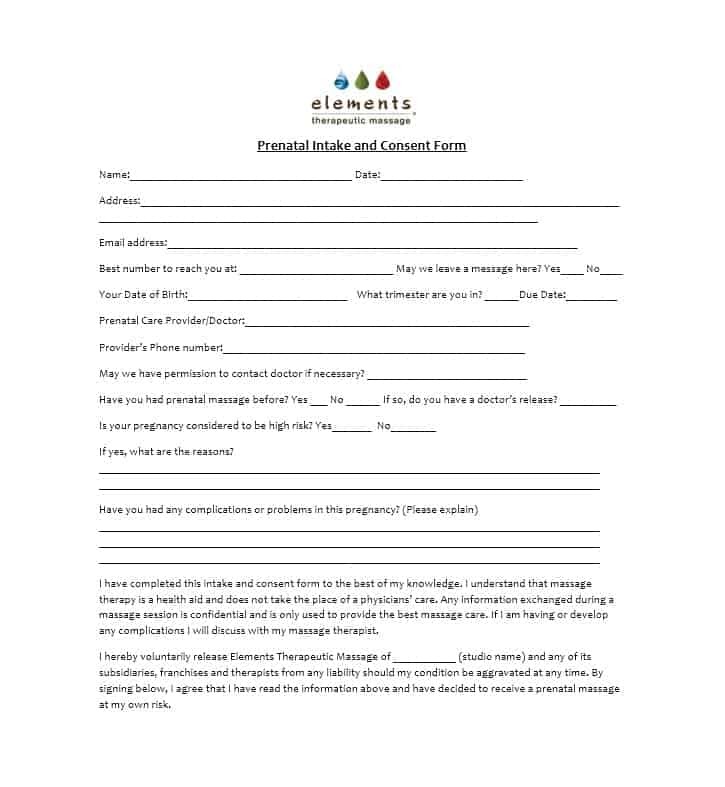 Talking about templates, you can access the patient registration form template and the medical consent form template online. 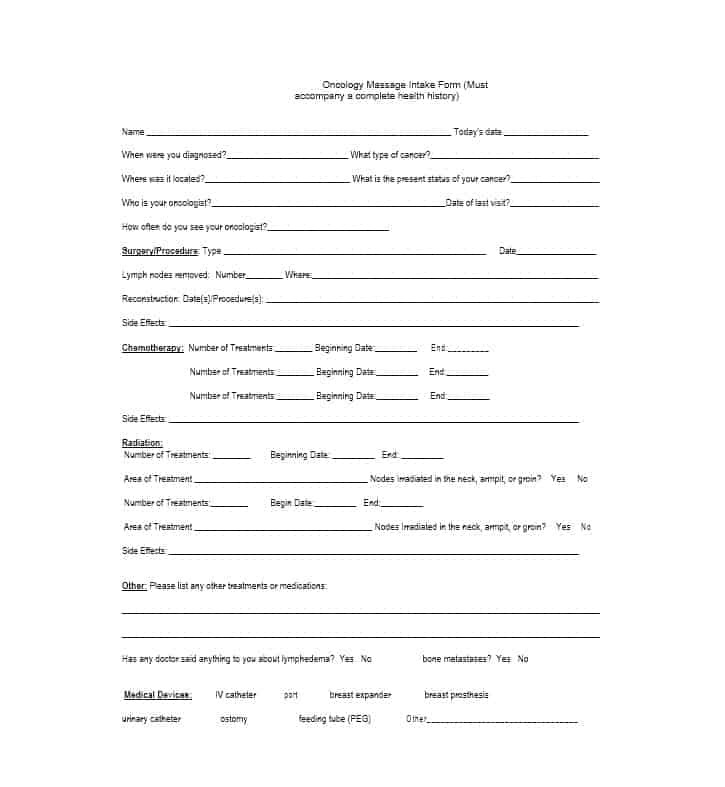 Now that we know what an intake form contains, it’s time to discuss how therapists should complete the form. Therapists need to follow certain steps to ensure that the information provided in the intake form is accurate and complete. 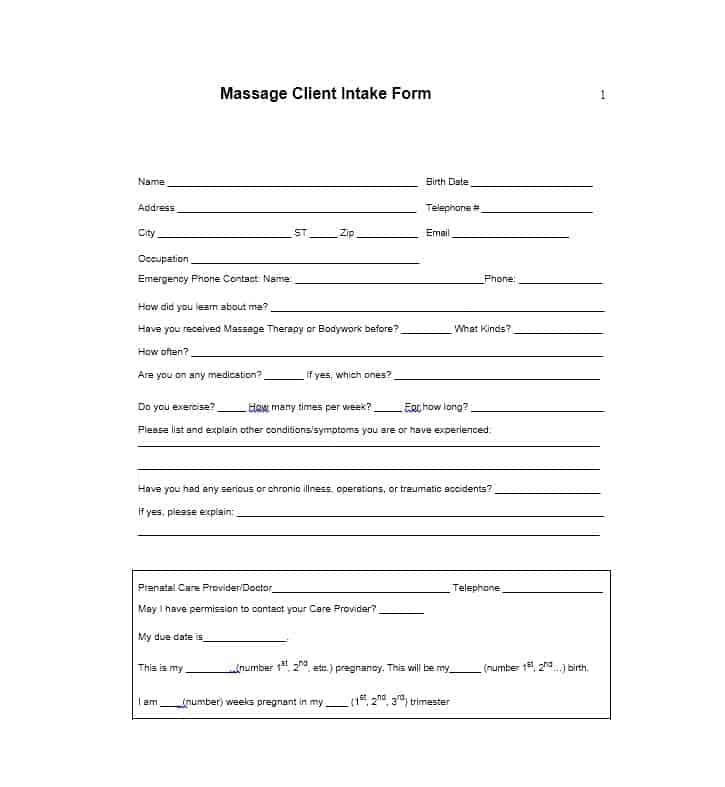 Following is how massage therapists should collect the information for the client intake form. 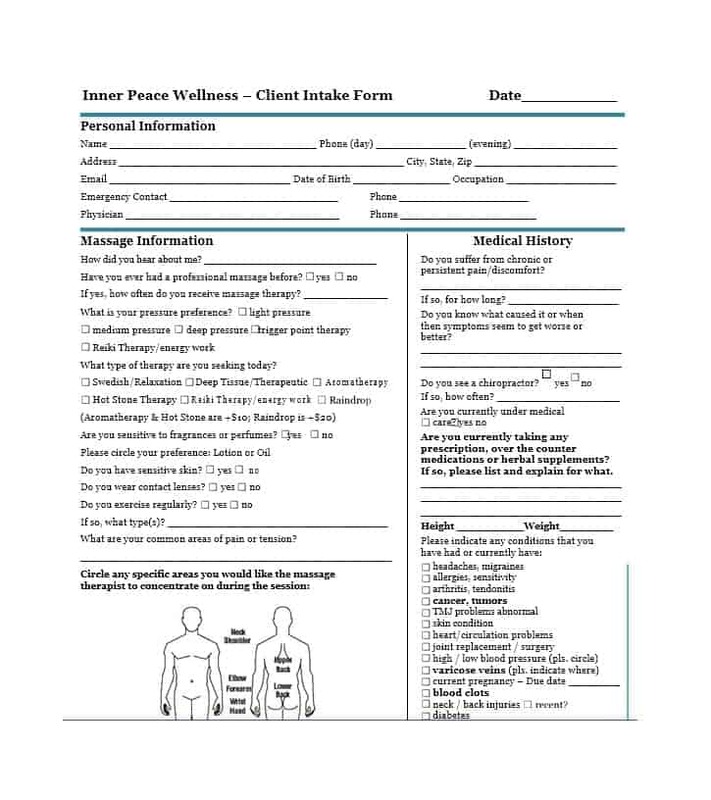 An important part of the intake form is the medical history of the client. To ensure that clients provide all the relevant medical history, therapists should discuss with them in person what health problems they have and what medications they’re currently taking. 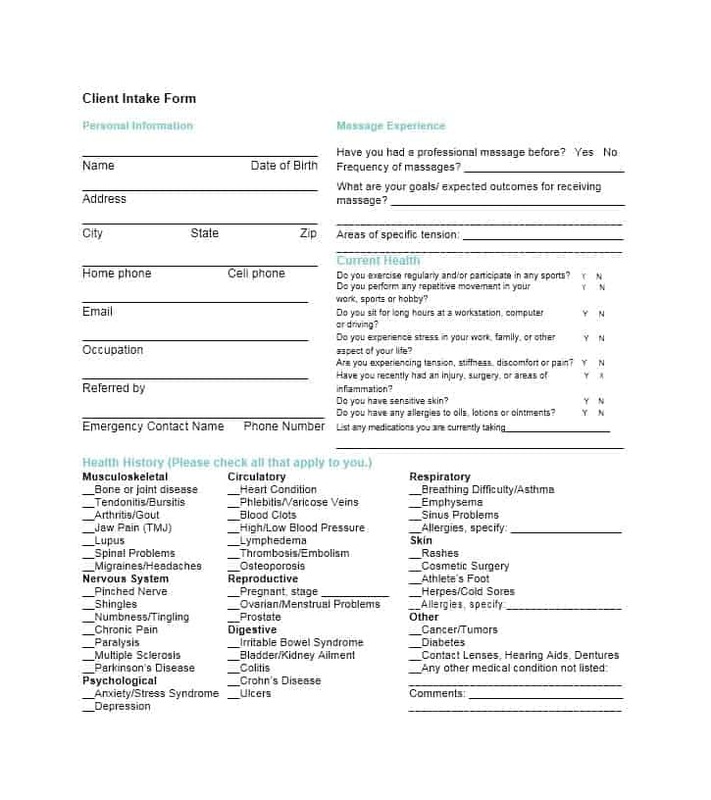 This should be done before the clients fill out the intake form. 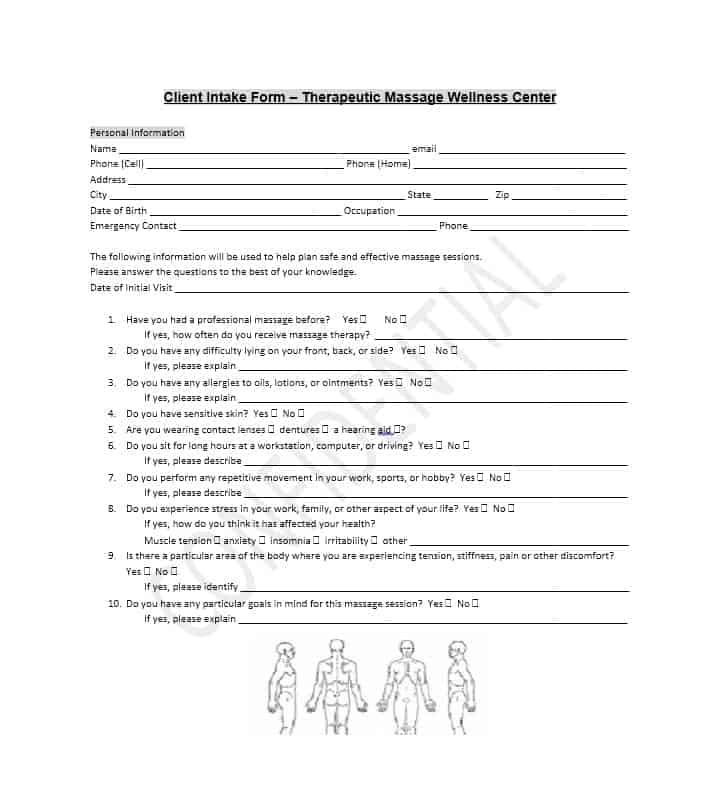 While the policies of the therapist will be mentioned in the disclaimer section of the intake form, notifying the client about the policies in person is a good thing for the therapist to do. The therapist should make it clear to the client that he/she is not a doctor and won’t prescribe medicine or diagnose illness. By doing this, the therapist will ensure that he/she is safe from legal liability in the future. By learning about the client’s background, previous health problems and any accidents, injuries or allergies, a therapist can prepare well for the therapy session. 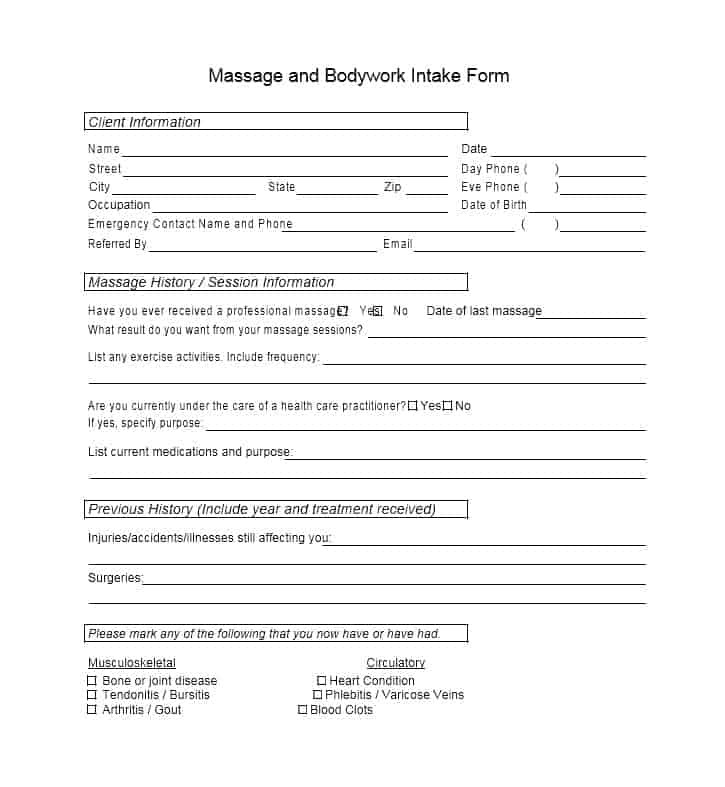 A good way to find out about the aforementioned things is using a massage intake form. In addition to the aforementioned things, some intake forms contain assessment charts and maps. This allows massage therapists to chart the client’s muscles strengths and track any trigger points. Ultimately, this makes the treatment plan more effective.